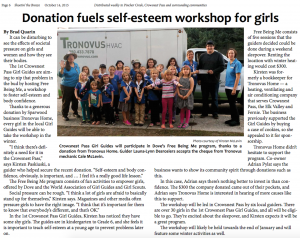 Tronovus is proud to support a self-esteem workshop for girls. With a donation from Tronovus, every girl in the local Girl Guides will have the chance to attend the Free Being Me self-esteem workshop. The workshop will take place during a weekend sleepover, which the 1st Crowsnest Pass Girl Guides are very excited about.